This option to lease contemplates a lump sum option payment made when the option agreement is signed. The option is designed to have the lease agreement specifying the terms of the tenancy attached to the option when it is executed. The lease agreement attachment is not part of this product when it is downloaded. 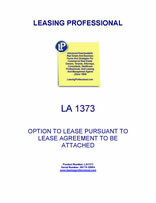 This Option to Lease ("Option Agreement") dated as of ___________, is entered into between ("Optionor") and ("Optionee"). A. Optionor is the owner of real property situated in __________ County, ____________, commonly known as _________________, and more particularly described in Exhibit A which is attached hereto and incorporated by reference ("Premises"). B. Optionee desires to acquire the exclusive right to lease the Premises on the terms and conditions set forth in the attached lease ("Lease") which is attached hereto and incorporated by reference as Exhibit B. 1. Option to Lease. Optionor grants to Optionee an option to lease the Premises on the terms and conditions more particularly described in the Lease. 2. Consideration. Concurrently with the execution of this Option Agreement, Optionee has paid as consideration to Optionor the sum of _________________ Dollars ($_____) for the option. No consideration shall be applied to or credited against any amounts due under the Lease if the option is exercised. 3. Term. This Option Agreement shall be effective as of the date first above written and shall expire at 5:00 p.m. on _____________ ("Option Term)". (c) lease guaranties executed by _______________ unconditionally guaranteeing the timely performance of the Optionee's obligations under the Lease in the attached form incorporated by reference as Exhibit C or, in the alternative, a letter of credit issued by a bank acceptable to Optionor. 5. Commencement of Lease Term. The Lease shall commence on the date on which Optionor has received all of the items required for the exercise of the option pursuant to 4. 6. Inspection Rights. At any reasonable time and upon reasonable notice, Optionee and Optionee's agents may enter upon the Premises to inspect the Premises and any of its furniture and fixtures. Optionee shall indemnify and hold harmless Optionor from and against any loss, claim, obligation, or damage caused by Optionee or Optionee's agents' entry and inspection of the Premises, its furniture, and its fixtures.